Sky Patterson speaks at ASG Senate. Election commissioner Dillon Saks said Patterson’s campaign committed two ASG code violations. 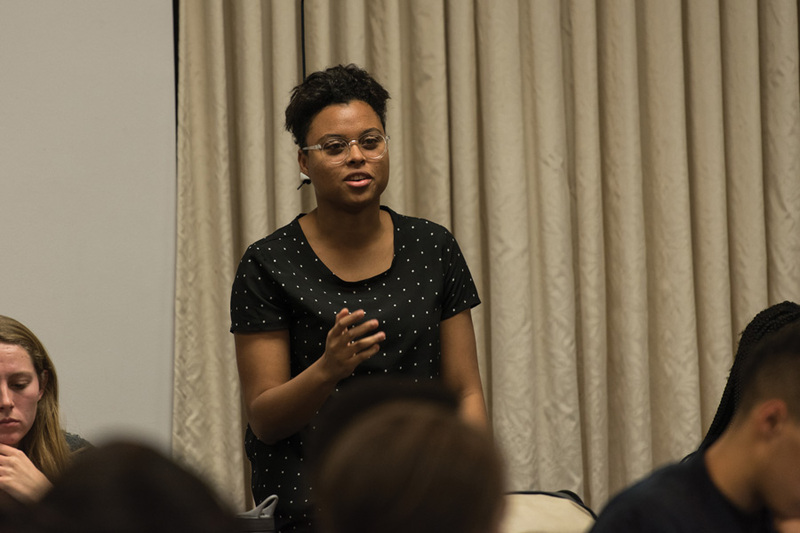 Weinberg junior Sky Patterson’s campaign committed two violations of election guidelines, Associated Student Government election commissioner Dillon Saks said in a Monday statement. Saks said Patterson and her running mate, Weinberg junior Emily Ash, violated campaign rules by prematurely engaging in pre-campaign activities and going beyond what is considered “acceptable pre-campaigning activities.” A third violation would remove them from the ballot, he said. The Weinberg sophomore said the campaign received its first violation for recruiting campaign personnel before the election commission had been elected, which officially marked the start of the pre-campaign period. The second violation came after the campaign sent out a pre-campaign email that was not “for the sole purpose of developing a platform” because it included promotional material, Saks said. Consequently, Patterson’s campaign received a $15 reduction of possible reimbursement for campaign expenses, he said. Patterson deferred comment to campaign manager Jillian Gilburne, who wrote in a statement to The Daily that Patterson’s team felt these code violations are “minor” and distract from the campaign’s platform and policy proposals. Gilburne said the first violation pertained to her hiring, which was not formalized until the pre-campaign period began. She declined to comment on the second violation, but said the campaign is in the process of appealing it. Saks told The Daily there is no opportunity for another appeal. However, he said, violations of the guidelines are common and “expected.” Nehaarika Mulukutla, the current ASG president, echoed Saks, adding that the violations are common due to the number of rules and regulations. Saks said the commission knew of the first violation during the pre-campaign period. The second incident was not initially considered a violation, he said, but was appealed over Spring Break and confirmed Sunday by the Rules Committee. News of the code violations came the same day The Daily reported that the Office of Student Conduct will look into whether members of Patterson’s campaign violated the Northwestern directory policy when they collected personal student information and sent unsolicited emails through the email marketing service MailChimp. Saks declined to comment on whether ASG is considering an investigation on the matter. SESP junior Justine Kim, who is also running for ASG president, said even if the other campaign didn’t intend to break any rules, the election is still affected. Kim added that she could not determine how impactful the violations are. In her own campaign, Kim said she was “intentional” in ensuring that she and her staff upheld ASG rules and standards.